Anaphylaxis is a severe, life-threatening allergic response. It can occur within seconds or minutes of exposure to something you're allergic to, such as a peanut or the venom from a bee sting. The immune system creates specific immunoglobulin E (IgE) antibodies towards a substance that is normally harmless. The body becomes sensitized to this substance, but when the person is exposed to it again, the IgE antibodies recognize this substance and activate immune cells to release large amounts of inflammatory substances, including histamine. These substances can cause the symptoms of anaphylaxis, which may include swelling, hives, lowered blood pressure, shortness of breath, wheezing, difficulty swallowing, and loss of consciousness. Anaphylaxis requires an immediate trip to the emergency department and an injection of epinephrine. In severe cases, a person will go into anaphylactic shock. Blood pressure drops severely and swelling occurs in the bronchial tissues, causing symptoms of choking and loss of consciousness. If anaphylactic shock isn't treated immediately, it can be fatal. What is the history of anaphylaxis? To fully understand this term, we need to go back almost 100 years. The story begins on a cruise aboard Prince Albert I of Monaco's yacht. The prince had invited two Parisian scientists to perform studies on the toxin produced by the tentacles of a local jellyfish, the Portuguese Man of War. Charles Richet and Paul Portier were able to isolate the toxin and tried to vaccinate dogs in the hope of obtaining protection, or "prophylaxis," against the toxin. They were horrified to find that subsequent very small doses of the toxin unexpectedly resulted in a new dramatic illness that involved the rapid onset of breathing difficulty and resulted in death within 30 minutes. Richet and Portier termed this "anaphylaxis" or "against protection." They rightly concluded that the immune system first becomes sensitized to the allergen over several weeks and upon reexposure to the same allergen may result in a severe reaction. An allergen is a substance that is foreign to the body and can cause an allergic reaction in certain people. The first documented case of presumed anaphylaxis occurred in 2641 BC when Menes, an Egyptian pharaoh, died mysteriously following a wasp or hornet sting. Later, in Babylonian times, there are two distinct references to deaths due to wasp stings. Charles Richet was awarded the Nobel Prize in 1913 for his work on anaphylaxis. Richet went on to suggest that the allergen must result in the production of a substance, which then sensitized the dogs to react in such a way upon reexposure. This substance turned out to be IgE. In the first part of the 20th century, anaphylactic reactions were most commonly caused by tetanus diphtheria vaccinations made from horse serum. Today, human serum is used for tetanus prevention, and the most common causes of anaphylaxis are now penicillin and other antibiotics, insect stings, and certain foods. What are the most common causes of anaphylaxis? Anaphylaxis is a severe, whole-body allergic reaction to a chemical that has become an allergen. After being exposed to a substance such as bee sting venom, the person's immune system becomes sensitized to it. When the person is exposed to that allergen again, an allergic reaction may occur. Anaphylaxis happens quickly after the exposure, is severe, and involves the whole body. Tissues in different parts of the body release histamine and other substances. This causes the airways to tighten and leads to other symptoms. Some drugs (morphine, x-ray dye, aspirin, and others) may cause an anaphylactic-like reaction (anaphylactoid reaction) when people are first exposed to them. These reactions are not the same as the immune system response that occurs with "true" anaphylaxis. However, the symptoms, risk for complications, and treatment are the same for both types of reactions. Pollens and other inhaled allergens rarely cause anaphylaxis. Some people have an anaphylactic reaction with no known cause. Anaphylaxis is life-threatening and can occur at any time. Risks include a history of any type of allergic reaction. Current estimates put the number of annual deaths in the U.S. due to anaphylaxis at approximately 1,500 per year. Although anaphylaxis can be due to different causes, there are four major subtypes of anaphylaxis (reactions to food, drugs, latex, and insect stings). Depending on the substance causing anaphylaxis, the rate of anaphylaxis upon exposure to a substance has been estimated to be between less than 1% to up to 10%. 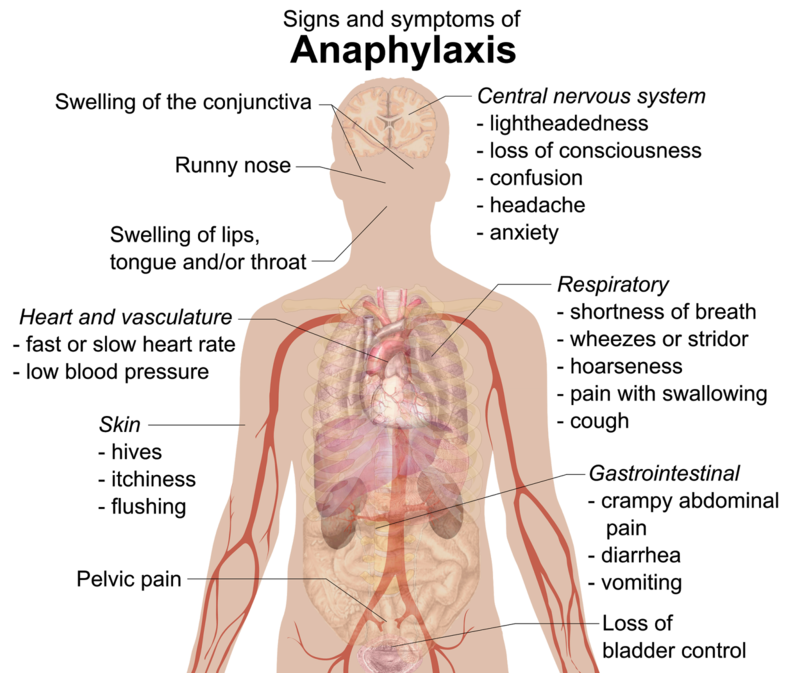 What are the symptoms of anaphylaxis? 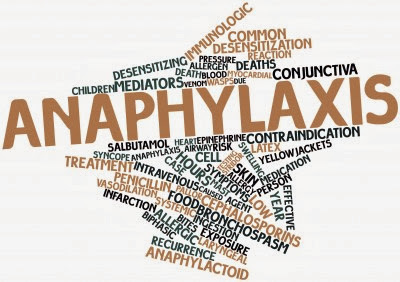 If you have symptoms of anaphylaxis, seek immediate medical attention, as the condition can quickly result in an increased heart rate, sudden weakness, a drop in blood pressure, shock, and ultimately unconsciousness and even death. Seek emergency medical help if you, your child or someone else you're with has a severe allergic reaction. If the person having the attack carries an epinephrine autoinjector (such as an EpiPen or EpiPen Jr), give him or her a shot right away. Even if symptoms improve after an emergency epinephrine injection, a visit to the emergency department is still necessary to make sure symptoms don't return. Make an appointment to see your doctor if you or your child has had a severe allergy attack or any signs and symptoms of anaphylaxis in the past. The diagnosis and long-term management of anaphylaxis are complicated, so you'll probably need to see a doctor who specializes in allergies and immunology. Anaphylaxis is diagnosed based on its symptoms. People with a history of allergic reactions may have a greater risk for developing a severe reaction in the future. Skin testing and RAST blood tests may help confirm the substances that cause severe allergic reactions. If anaphylactic reactions are suspected, testing should be performed under the guidance of a medical professional with training and experience in selecting appropriate tests. The only effective treatment for acute anaphylaxis is epinephrine (adrenaline) by injection. Epinephrine works quickly to reverse anaphylactic symptoms. Epinephrine can be given through a self-delivered injection device. The most common injection site is the thigh. If you are near someone who is going into anaphylactic shock, call for professional medical help immediately. CPR and other lifesaving measures may be required. If breathing is compromised, medical professionals may have to place a tube through the nose or mouth into the airway (endotracheal intubation) or even perform emergency surgery to place a tube directly into the trachea (tracheostomy). In addition to epinephrine, treatment for shock includes intravenous fluids and medications that support the actions of the heart and circulatory system. After a person in shock is stabilized, medications such as antihistamines and corticosteroids may be given to further reduce symptoms. Get the person in a comfortable position and elevate his or her legs. Check the person's pulse and breathing and, if necessary, administer CPR or other first-aid measures. Give medications to treat an allergy attack, such as an epinephrine autoinjector or antihistamines, if the person has them. If your anaphylactic reaction is triggered by insect stings, you may be able to get a series of allergy shots (immunotherapy) to reduce your body's allergic response and prevent a severe reaction in the future. Unfortunately, in most other cases there's no way to treat the underlying immune system condition that can lead to anaphylaxis. But you can take steps to prevent a future attack — and be prepared in the event one does occur. Avoid your known allergy triggers as much as you can. You may need to carry self-administered epinephrine. During an anaphylactic attack, you can give yourself the drug using an autoinjector (EpiPen, EpiPen Jr or Twinject). Your doctor may recommend taking prednisone or antihistamines. Wear a medical alert necklace or bracelet to indicate if you have an allergy to specific drugs or other substances. Do not use your injectable epinephrine on anyone else. They may have a condition (such as a heart problem) that could be negatively affected by this drug. Alert your doctor to your drug allergies before having any medical treatment. If you receive allergy shots, always wait at least 30 minutes before leaving the clinic so that you can receive immediate treatment if you have a severe reaction after the allergy shot. Keep a properly stocked emergency kit with prescribed medications available at all times. Your doctor can advise you on the appropriate contents. This may include an epinephrine autoinjector. Make sure your autoinjector has not expired; these medications generally last 18 months. If you're allergic to stinging insects, exercise caution when they're nearby. Wear long-sleeved shirts and pants and don't wear sandals or walk barefoot in the grass. Avoid bright colors and don't wear perfumes or colognes. Stay calm if you are near a stinging insect. Move away slowly and avoid slapping at the insect. If you have specific food allergies, carefully read the labels of all the foods you buy and eat. Manufacturing processes can change, so it's important to periodically recheck the labels of foods you commonly eat. When eating out, ask about ingredients in the food, and ask about food preparation because even small amounts of the food that you're allergic to can cause a serious reaction. If you are allergic to bee stings or any substances that cause anaphylaxis, you should always be prepared. Carry an epinephrine injection kit with you at all times. Also, if you have any drug allergies, you should always inform your health care provider before undergoing any type of treatment, including dental care. It is also a good idea to either wear jewelry or carry a card that identifies your allergy. In cases of emergency, it could save your life.